When Keith Earls recovered brilliantly to make a last-ditch ankle tap on Elliot Daly, few of his myriad admirers realised that nibs of snow had started to come with the icy wind. It was a very cold St. Patrick’s Day in London, but in retrospect most of those in green at Twickenham will remember that moment as a fragment of the summer that was to follow. Many of those in attendance as Earls was named the Zurich Irish Rugby Players’ Player of the Year dipped into their imaginations and told those seated beside them that they were there. They may have been watching from Searsons of Baggot Street or in the White House Bar in Limerick, but they say it anyway – and they were right. David Wallace will certainly have told his kids that he played with the winger from Moyross. While Earls prepares for interprovincial action this week, the former Munster and Ireland flanker travelled to New York alongside several of his 2008 European Cup-winning teammates. 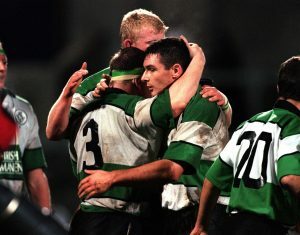 Ten years on from their triumph in Cardiff, they were honoured at a fundraiser that will benefit underage rugby across the province and aid Munster community rugby programmes. 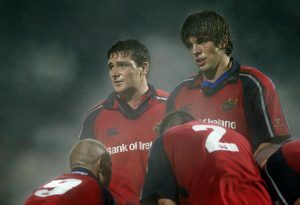 Combining the traditional strengths of Munster Rugby: leadership, game management and a doggedness rarely matched in the professional game, Declan Kidney added a cutting edge to the insatiable Munster passion in 2008. Although the team was sprinkled with Irish talent, it was two south sea islanders paved the way in midfield while a legendary All Black drove the standards out wide. Waiting in the wings, Keith Earls undoubtedly learned from Lifeimi Mafi, Rua Tipoki and Doug Howlett as Munster shifted from outright passion to clinical rugby. Incidentally, Earls is one of only three characters to whom Wallace refers, who continue to tog out every weekend. Mafi has lined out for Manawatu in this season’s Mitre 10 Cup, Donnacha Ryan defies Father Time on a weekly basis in Paris, while a little closer to home the Players’ Player is in the form of his life. “It’s great to see the lads doing so well,” Wallace says. “In fairness, Strings and Donners made a good go of it too until recently. But now that the rugby is out of the way for the majority of the team it’s great to be able to reconnect and bring everyone back together. You’re all on a different pathway for a while, especially the lads who are still playing. You might only catch them after the game for a few seconds before someone else grabs them. Of course, we hope that Keith Earls won’t be joining them anytime soon. The winger was one of the new breed when he sat on the bench for the 16-13 victory over Toulouse. Having made his Munster bow as a 19-year old, Earls provided injury cover for Ireland’s 2009 Grand Slam triumph just over a year later. Surrounded by the greatest dynasty of players ever assembled by club or country, the 2009 Lions tourist would have been forgiven for anticipating a trophy-laden career. However, as Wallace can attest to, injuries can wreak havoc with those plans. Wallace’s household have duly followed his lead and cycling holidays have become a regular feature of the family calendar. Recently, Wallace also accompanied his brother Paul on the CROSS Charity Annual Cycle which raises money for cancer research. With many former teammates also participating, it is a few days that Wallace looks forward to every year. “It’s great fun. You get to know a lot of the faces that return year on year and the camaraderie inevitably builds. It can prove to be a little reminder of our playing days and our tours! It is very enjoyable but there is a lot of hard work, albeit less pressurised! Going into retirement I was looking forward to my weekends or getting involved in things without the burden of having to perform or meet expectations. Between training, matches and off-field responsibilities it is a very intense environment, physically and psychologically. You only realise that when you leave it.